I've been a Lush customer for over a decade, and I've followed the various permutations of the company's fragrance line with interest, from B Never Too Busy to Be Beautiful to Gorilla Perfume and everything in between. Lush's latest fragrance line has delighted me so far; as Robin has said, Mark and Simon Constantine continue to produce "unusual, well-crafted and reasonably priced perfumes whilst seemingly paying no mind to the conventions that rule the rest of the fragrance industry." Sikkim Girls is described as "subtle, seductive, heady, exotic, floral...frangipani, jasmine, vanilla and tuberose conjure up exotic climes and heady possibilities." Its name comes from an anecdote related by the musician Sheema Mukherjee: Mukherjee met a café owner in Darjeeling who claimed that his son-in-law had been lured away by two "Sikkim girls," unlikely sirens who entranced him with their feminine wiles despite being fully, even modestly, dressed. Its white floral notes, appropriately enough, are traditional but surprisingly heady, not to mention quite long-lasting on the skin. Like many Lush fragrances, Sikkim Girls comes on strong and just a bit raw-edged. Its intermingled floral notes appear up front, without any need for a gradual introduction. The jasmine is sweet, the tuberose is creamy, and the vanilla is lightly earthy. I notice a lot of frangipani, and I like it more than I expected to, perhaps because it's not spiked with citrus notes or coconut. (When Sikkim Girls evokes the "exotic," it's aiming for something more interesting and sophisticated than a tropical beach fantasy-cliché.) The composition also seems to include a soft, milky-almondy note that reminds me of mimosa. Overall, Sikkim Girls smells very feminine, and it's one of the more "perfume-y" scents in the new Gorilla line. However, it still manages to stay lively enough to avoid the "old-fashioned" label. (Don't get me wrong: I like vintage-y fragrances, but white florals tend to feel a bit prim and stuffy for my taste if they're not done right.) If I were to draw some comparisons between Sikkim Girls and other white floral blends, I could call Sikkim Girls a hippie cousin to Annick Goutal's frangipani-jasmine-vanilla Songes, or say that it's a more "natural"-smelling alternative to Madonna's Truth or Dare. And, although it's more light-hearted than fragrances like the iconic tuberose Robert Piguet Fracas, it does feel informed by classical white florals. On the other hand, I'd like to enjoy Sikkim Girls just on its own merits. Sikkim Girls has impressive sillage for its first hour or two; I wore it on a chilly early-spring day, when I was in and out doing neighborhood errands, and every time I removed my gloves or scarf I caught a fresh wave of fragrance. As it wears down, Sikkim Girls stays closer to the skin, but it still has impressive staying power. I suppose this fragrance has been successful in its seduction of this particular wearer (me! ), and if you're in the mood for an artisanal-feeling white floral fragrance, you may also succumb to its spell. 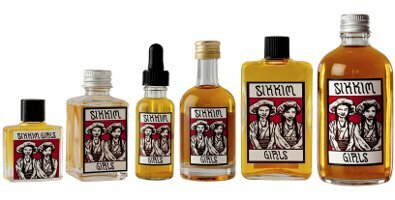 Lush Sikkim Girls is available in a range of sizes from 9 ml ($19.95) to 92 ml ($99.95), in an assortment of stopper bottles and splash bottles. For purchasing information, see the listing for Lush under Perfume Houses. As of this writing, the following stores in the US have the collection: Portland, OR; New Orleans; Bucktown, Chicago; Glendale, Los Angeles (limited time); Partridge Creek, Detroit (limited time); Union Square, New York City; Walnut Street, Philadelphia and Austin, TX. Look for the set to appear in additional stores for a limited time over the summer. This was my favorite of the new collection when I tried them briefly during SXSW. I might get the mini of it. Agree, a lot, with the Madonna Truth or Dare comparison. Although I’d take this over Truth or Dare! They were at SXSW? How fun! Oh, well, initially Austin didn’t get the new Lush perfume collection. I was downtown for a SXSW show at Waterloo Records, our wonderful local record store, and Lush happens to be next door to Waterloo, so after the show I stopped in. The sales associate said that Austin had just gotten in the new perfumes that week in anticipation of SXSW. Pretty cool of them, since we weren’t in the group of cities that were to get them! Oh! I was imagining Gorilla Perfume’s traveling bus pulling up to the concert-grounds. Still, nice timing! This sounds interesting. I’ll pop in to the Herald Square store one of these days although the last time I was there and was looking around for the previous series of perfumes, I was told that they were only available at the downtown store and that the Herald Square store may get them in April. Hi, Hajusuuri — I visited Herald Square on Wednesday evening; no perfumes yet. But the Union Square shop does have the whole line, and their staff is nice and helpful. Hope you can sniff them soon! This one and Flower’s Barrow are my favorites from the new line. I did finally get to try Furze, and liked that one, too, as well as Hellstone — in fact, I wouldn’t mind having the little 7 mlers of all the fragrances, and it’s so tempting, because they’re very reasonable — but this SG and FB are definitely dropper-bottle-worthy. Those tiny bottles are great, and I love the label illustrations! Such a fun and smart collection, all around. Gorgeous packaging and a wonderful range of sizes and types. I do love Lush’s range of scents, might seek this one out when it is released in Australia. Yes! Do check it out. I love the range of sizes and bottle shapes, too. So clever. I haven’t tried that one! I need to go back to the store. Since all the scents actually have very distinct personalities (!!! ), I didn’t want to test more than two or three at a time! I was in Seattle last month and stopped by the Westlake store. The SA there told me they think they’re getting this series in April. Heaven only knows when I’ll get a chance to sample these; the Lush store nearest to me is about 50 miles away and gets limited products. If only Lush would do a sample coffret. Sigh. I agree… a sample coffret would make this a perfect situation!! Last week at work, I had just swatched a rollerball of vintage Deneuve parfum (what a great chypre!) on the back of my hand as a scent break, and a young colleague came by for an impromptu meeting. She asked if I was wearing a Lush perfume! Ah! That is really funny. Everything old is new again. I only sniffed The Bug from the bottle, but I want to go back and try it on my skin. If my husband wore fragrance, I’d buy him a bottle! I LOVE that dropper bottle packaging. An interesting and as you say seemingly atypical Gorilla perfume. The Dandy is discovering a taste for tuberose somewhat late in the day, so I will be sure to give this go, just a worry might it be a little sweet for man whose favourite of this flower is Diptyque’s divine Do Son? I have mentioned elsewhere that I enjoy this line but I wanted to record a big thank you, Jessica, for the hippie Songes comparison because I think that is spot on! I do love Songes but I have the EDP and it can get overwhelming – this less so. I might succumb to the littlest size. I haven’t encountered Songes as of yet, but it sounds right up my alley. I used to post as jasmindreams, I think but for some reason can’t access my account info or remember my password… oh well. I love this scent! It’s amazing. It’s something my fella and I both can agree on, as he likes foodie scents and I enjoy white florals and it’s a nice meeting of the minds. There is something “hippie” ish about it. It’s warm, sunny, tropical without being fruit punch and flowers without being old-lady-in-church scent. It reminds me of a golden, lazy sunset. Love, especially in sun-deprived Pennsylvania. I agree with the bottle dropper packaging commenter, I also ordered that size and I think the dropper helps with application. This was a green, vegetal, pungent concoction with a bit of spice on my skin. Not good if you’re expecting lush jasmine & tuberose It wasn’t that ‘bad’ actually – at one stage it reminded me of Chanel no. 19 (which says a lot aboout what I think of no 19 lol). I was 100% convinced I’d sprayed on a wrong scent. When I walked back to the store to ask the SA, she told me it was a case of skin pH ‘turning’ the scent green. A bit odd given the juice smelled weird both on the blotter and on me. Ah well.